4-8-206: Up on the Sunshine Slabs (Y11/River Rd, 5.5 Miles north of Paradox Valley) Charlie and I established three new routes. 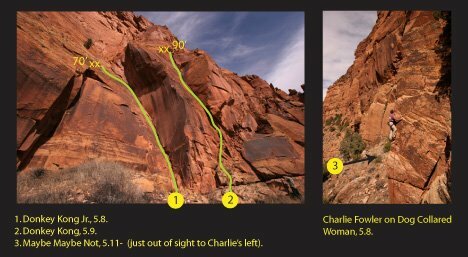 The first route we did was just to the left of Dog-Collared-Women (see Blog below) that ascends a thin corner/seam through an overhang and finished up a thin face. We called this route Maybe Maybe Not, 5.11-, thin gear in the beginning then past three bolts (this route uses D-C-W’s anchor). Then to the climber’s left of this (and two the right of Manic Monday) we did two new crack lines: Donkey Kong Jr., 5.8, 70’ (a hand to thin hand crack in a corner that traverses left using a flake to the top—it was possible to place a 3.5 Camalot) and Donkey Kong, 5.9, 90’ (wide hands to OW—lots of big gear—Camalots #6 x 2, #5 x 1, #4.5 x 1, #4 x 2, #3.5 x 2, #3 x 4, #2 x 3). The beginning of this route takes some figuring-out. My only hint: Look for face holds.